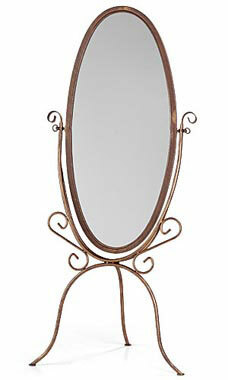 • Mirror Surface 39 1/2"
Take a second glance at our boutique cheval floor mirrors! Give your customers everything they need to make the best fashion choices by placing these graceful mirrors next to clothing racks, inside fitting rooms, or by the cash wrap for last minute visual affirmation! The overall height of the mirror stands at 60 inches with a tilting, oval mirror surface of 39 ½” x 17” for plenty of opportunity for reflection. Choose our popular cobblestone finish or our radiant opal glazed ivory finish to go with the theme of your store!